The Inside Line Experience is a North American fundraising event sponsored by MX for Children to support clinical research at seven children’s hospitals around the US and Canada. It is targeted at Supercross fans and provides incentive prizes to fundraisers in certain Supercross cities where we host events. Fundraisers who achieve the $500 fundraising level are invited to our exclusive Inside Line Experience — a unique multi-day behind the scenes look at a Supercross race for two. You start off with a “meet and greet” with top Supercross racers in a private, informal relaxed atmosphere for autographs, pictures and open Q&A. Then you watch the pre-race press conference. Afterwards, you go into the stands to watch a private practice from front row seats before the Supercross track is even complete. Then on race day, you get to tour your choice of factory rig, walk the Supercross track, pit passes (if available) and enjoy the race with great seats! How do I participate in the Inside Line Experience? The Inside Line Experience is a reward for participants in a pledge drive to raise funds for a local children’s hospital and their research to prevent hydrocephalus — the #1 cause of brain surgery in children. To qualify you have to raise at least $500 in pledges or donations to the designated hospital prior to the pledge drive close date. 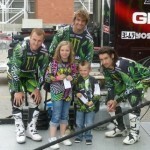 Winners come to the stadium on the Thursday before Supercross and back again on race day. You can register to participate for U.S. cities at http://mxforchildren.kintera.org/2015. 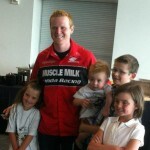 At what Supercross races does MX for Children host the Inside Line Experience? What local children’s hospitals receive support from the Inside Line Experience? The Inside Line Experience pledge drives support: Toronto’s SickKids Hospital, Houston’s Texas Children’s Hospital, Seattle’s Children’s Hospital, St. Louis Children’s Hospital, Salt Lake City’s Primary Children’s Hospital, Children’s Hospital of Pittsburgh and Children’s Hospital of Alabama. Where can I sign up for one of the Inside Line Experience for 2015? Our online fundraising site U.S. cities can be found at http://mxforchildren.kintera.org/2015 . When you sign up, you create a “team” even if you are an individual fundraiser. Sign up for any of our Inside Line Experience cities.